In recent years, there has been a surge of interest in the use of supply-side climate policies (ie those aimed at reducing the supply of fossil fuels) as an alternative to demand-side approaches, such as carbon taxes (ie those aimed at reducing the use of fossil fuels). Proponents assert that where demand-side policies have failed, supply-side approaches will succeed, often ignoring or downplaying the institutional, political, social and economic factors that impede progress and the importance of policy design. To illustrate the types of design flaws that can emerge in supply-side approaches as a result of these factors, this article critically evaluates one of the most well-known of these proposals, Ecuador’s Yasuní-ITT Initiative. The article analyses the factors that shaped its design and its technical deficiencies, providing new insights on why the Initiative failed and the blessings in its termination. The lesson from the Yasuní-ITT Initiative is that, while supply-side approaches have potential, like demand-side approaches, their effectiveness depends on how well central policy actors supportive of their use are able to manage the factors that shape and constrain their choices, and how this is reflected in policy design and implementation. Anthropogenic climate change is emerging as a dynamic and multi-scale threat to biodiversity. Yet our existing laws on threatened species are largely based on outdated theories of ecological management, making them poorly prepared to address this pervasive new threat. This article pursues three lines of enquiry to identify global best practice for threatened species legislation in the context of climate change. As a foundation, it considers what constitutes best practice ecological management in the context of climate change (drawing on principles of socio-ecological systems theory, adaptive governance and resilience-based governance). It proceeds to examine whether current threatened species laws are consistent with this best practice and, finally, it proposes how these laws could be reformed to more effectively protect threatened components of biodiversity in the context of climate change. Based on these lines of enquiry, this article finds that there is strong potential for ecological management principles to be more comprehensively incorporated into threatened species legislation. However, care should be taken to ensure that these principles are incorporated in a way that upholds sufficient legal certainty and accountability and strikes a balance between process-based and outcomes-based duties, in order to meaningfully contribute to a coordinated multi-scale response to climate change. The Brown Mountain case is a landmark decision with significant implications for State forest harvesting practices and ecologically sustainable forest management in Victoria. The decision is analysed here in the context of VicForests’ Ecologically Sustainable Forest Management Plan published in December 2015. This article discusses the requirements for a meaningful sustainability plan for harvesting in State forests and highlights continuing problems in achieving best practice sustainable forest management under the current regime. This article investigates the range of spatial planning instruments being considered or implemented by local governments in Western Australia for responding to coastal erosion and inundation hazards. It examines whether the existing legislative framework is inhibiting the implementation of these instruments, or if any such inhibitions are due to other significant factors. Particular consideration is given to the revised State Coastal Planning Policy adopted in 2013. Using interviews with local planners this research finds that many instruments have been applied either in response to coastal hazards or for other planning purposes. However, widespread instrument use for adaptation purposes has been limited in the absence of sufficient implementation guidance. Significantly, the revised policy states an explicit preference for relocation over coastal protection. However, planners are unsure how these instruments can be used to implement relocation strategies in existing urban areas for the purposes of preserving public amenity, without significant investments in land acquisition. This article demonstrates the role that social justice research can play in all levels of government, facilitating the incorporation of justice principles into statute by the legislature, into decision-making by the Executive, and into the common law of procedural fairness by the judiciary. The recent case of Jacob v Save Beeliar Wetlands (Inc) demonstrates the significance of justice research; not just the dangers of ignoring it, but the many ways in which justice research can advance the law and improve community trust in allocative decision-making. 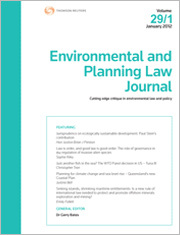 For the PDF version of the table of contents, click here: EPLJ Vol 34 No 2 Contents.